First is the ability to sustain a given level of power output while moving up the wall. Beyond moving up the wall, endurance can mean the ability to recover at stances along the route. Endurance can also mean the ability to recover between efforts, such as resting between pitches. Endurance is also a term used in regard to the ability to do a lot of climbing in a single day or several days in a row. So, what is the solution? Can we train for all of these goals concurrently? Are these abilities all improved by the same types of exercise? Most importantly, can we improve our endurance without diminishing our power or strength? Sports science defines endurance as the ability to sustain a given power output for a prescribed duration. This can take the form of high power outputs for relatively short periods – what we might call power endurance – or it can take the form of fairly low power output over greater durations, what climbers might call pure endurance or stamina. In Physiology of Exercise for Physical Education and Athletics, Herbert Devries laid out a encyclopedic framework for looking at the factors affecting endurance. I am going to list these below, and then we’ll look at how each can be manipulated, and by how much, for better climbing. As we look at endurance in climbing it is critical to understand that aerobic and anaerobic endurance are two markedly different types of endurance and that each can function on a global (whole body) or local level. Additionally, development of one energy system can result in a decline in the other, and working toward better local endurance won’t necessarily mean better whole body endurance, and vice-versa. Worst of all, developing a training plan based on replicating how you feel when tired is almost never the most useful program. Feeling boxed in? You should be. The stronger a muscle group (in our case the forearms and fingers), the less muscle needed to generate a given amount of force, and thus the move-for-move load on the muscle is less. A very strong-fingered climber uses but a small percentage of his grip capability on any given move, so the muscles stay fresh, easily supplied with blood, and ready for the next hold. We all know how to train for stronger fingers, so let’s do that as a good basis for building better endurance, too. I see this as foundational to endurance, and thus is a necessary part of the endurance training of every climber. 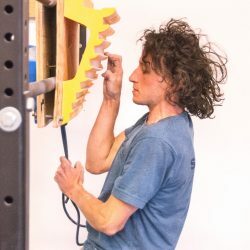 In the past, climbers tended to build up strength in the off season and then slowly let it drift away as they focused on endurance, we now know that strength must be maintained year-round through minimal levels of finger strength and power maintenance – even when we are in an endurance phase. You can increase the energy storing capacity of a muscle to improve its endurance. This is primarily done by various methods of increasing muscle glycogen, none of which creates a permanent higher-energy situation. The best-known method is carbo-loading, in which an athlete attempts to “over-feed” the muscle in hopes of increasing energy. This has been proven effective tim and time again in endurance athletes, but it comes at a cost – most effective loading strategies include a weight gain of around 1-2% in the form of added water…which might not be that useful in a bouldering or sport climbing scenario. Foralpine efforts or big walls, it may be a good practice. Athletes can also “eat low.” By maintaining a very low carbohydrate diet during training, many athletes have seen positive adaptations in the body. Low levels of glycogen stimulate production of glycogen synthetase, which then enhances the ability to store energy in the muscles. Again, maybe not the best for climbers since low levels of glycogen can mean lower power outputs. Finally, consistently reloading glycogen after training seems to have a positive effect in energy storage. Eating within about an hour after training and consuming 100-200 calories of carbohydrates seems to do the trick for most athletes. For climbers, increasing energy storage is probably not the most effective means of increasing endurance and should be viewed as a “side dish” to better methods, described later. If you have climbed for any length of time, chances are the capillary density in your forearms is already quite high. In the 1990s, climbers recognized the need for increased bloodflow to the forearms, and we started doing ARC (aerobic restoration and capillarity) training to address it. Sport science shows, however, that capillarity is specific to the muscle fibers being supplied by those capillaries. In other words, low-intensity climbing efforts increase bloodflow to the low-strength muscle fibers and there is a good possibility that this doesn’t really help when efforts get difficult. A safer bet would be to increase bloodflow to the higher-strength muscle fibers by using them in progressively higher volume efforts. This means interval-style efforts or longer sessions, programmed at adding demand to the body over a 12+ week time period. Capillary density in strength athletes has been shown to increase with added sets at a fixed load, but only after 3-4 months of training. If you’re serious about getting your capillaries up, consider sessions such as density bouldering sessions, high-volume alactic intervals, or on-the-minute bouldering sessions. “If you’re not strong enough to hold on, there is nothing to endure.” So goes the wisdom, and there is a lot of truth in it. What we are looking for when we gain strength is the ability to recruit a smaller percentage of the muscle mass at any given hold size. Climbers with extraordinarily strong fingers don’t grip as hard which allows their blood to keep flowing which keeps them from getting pumped. This plays out in all muscle groups of the body, so any climbing-specific strength training will lay a solid foundation for endurance. Strength should be tested once per month. During endurance phases, we want to see those numbers maintained, and during strength phases we want to see them go up. If your strength starts to back off, so, too, will the high-threshold endurance potential in that muscle. Strength training is so easy to implement and provides so many benefits – especially long-term – we’d be foolish not to do it all the time. Global energy storage is slightly different than local muscular energy storage. In addition to the glygogen stored in the muscle, the liver stores the next “layer” of available energy. Beyond that, the body stores large amounts of energy in the form of fat. Both liver glycogen and body fat can be mobilized for fueling movement, but the process is slightly longer and requires full-body metabolic transportation. Although it should not be your goal to increase the fat stores in your body, you can maximize the availability of both liver-stored fuel and fat. Science is conflicted on the “best” ways to increase fuel mobilization, but one thing seems to be clear – maintaining a steady, low heart rate all day long is a really bad idea. If you don’t move, and make your body work through different zones of effort, your metabolism becomes somewhat restricted and your ability to access liver glycogen quickly can decline. In order to maximize your ability to use fuel, then, you must use fuel. The recommendation is for daily exercise, and weekly variations in duration and intensity of that exercise. If you are exclusively an indoor boulderer, you might consider some long hikes 1-2x per week. Alpinists might consider doing some heavy resistance training. Look at what you do as far as duration and intensity of effort, and try to figure out what’s missing. Adding in some different work might help your fuel storage, and will help in other areas of endurance, too. I feel like endurance training can be a trap. We all know what it feels like to be at the limits of our endurance, whether nearing the top of a mountain or finishing a Zumba workout (come on – everyone does Zumba, right?). We are breathing hard, sweating, maybe a little nauseous. We sometimes even feel these same things toward the end of a particularly taxing pitch of climbing. The fallacy of general endurance training comes in thinking that getting to the point of these physiological responses – by any means necessary – will somehow improve your ability to handle any endurance situation. Respiratory function – How much air can you take in and how well can you transfer oxygen to the blood? 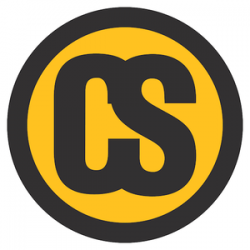 This factor can be trained well by general means, but for rock climbers and boulderers, this training is of limited value. Once you are about 10% above average in respiratory function, you are probably at a more-than-sufficient level for hard climbing. Stroke volume of the heart – Also well trained by general means, stroke volume is simply how much blood you can pump through the heart with each beat. Also not incredibly important to rock climbing, this is nice to develop if you are into big mountains or speed climbing on big walls. Ability of blood to transport oxygen – Raise the heart rate, increase body temperature, and oxygen transport and binding to hemoglobin increase, too. This factor is improved by everything from walking to sprinting to weight training, and some research suggests that athletes who train in multiple intensities and volumes are best adapted here. Congratulations, climbers. Capillarization of muscles – This is probably the most important factor for climbers to develop in endurance. The more blood we can push to that wonderful area between the elbow and wrist, the longer we hang on. Lots of pitches at low intensity, lots of mileage on the boulders, and slow, steady climbing all fit the bill here. Even nonspecific means, such as mega system board / weight training sessions can really add up. My biggest beef here is doing “dumb climbing” with only the clock in mind. If at all possible, build your mileage on real rock at low grades. Buffering capacity of the blood – Ouch. Fill the forearms with as much blood as possible, and stand it as long as you can. Rest and repeat. Intervals, 4x4s, etc. fit the bill here. This factor’s training tops out relatively quickly, so 4-6 hard sessions of any given type will probably get you 95% of what you need. Beware any “power endurance” program that lasts longer than a month. Ability to tolerate high acidity – clearly closely related to the last point, this ability is best trained at slightly lower intensities at slightly higher durations. The minute-on-minute-off foot-on campus ladder workout comes to mind… Same rules as above – do it for 3-4 weeks, then go back to focusing on getting more power. The better we can control our body temperature, the better our endurance. I remember well pumping my way out some of the testpieces at Tonsai and feeling like I was wrapped in a warm boa constrictor and had a plastic bag on my head. We joked that if the routes were in the Rockies, the’d be three grades easier. Why? Because we could stay cool. The best way to thermoregulate in endurance is to dress “too light” for the pitch so that when you get up high, you are at an appropriate temperature. Drink plenty of fluids, since water is essential for internal cooling and for sweating. Even though it looks like you’re riding a chicken when you’re wearing shorts, strip off those E9 pants and get the cool air in contact with your skin to cool off. This is not an easy factor to change over time, but is something you would take care of intelligently on a day-to-day basis. Humans have been wired for both gross motor and fine motor control. OVer generations, we’ve become better and better at fine motor tasks such as painting and writing and have slipped somewhat in the gross motor realm. What this means athletically is that although you want your fingers to be ungodly strong for climbing, you’re probably better adapted to typing on a keyboard – evidenced by the fact that pound for pound we are the weakest of the mammals. We can improve our nervous system efficiency by training specific to our task. 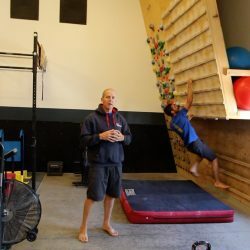 Yes, going climbing is the ultimate expression of efficient movement for climbers, but learning other tasks, whether they be in the weightroom, on the gymnastic rings, doing parkour, or even mastering the much-lambasted new-style bouldering can help with your nervous system development. Many experts recommend trying to take on and master one new sports movement per year as we age. 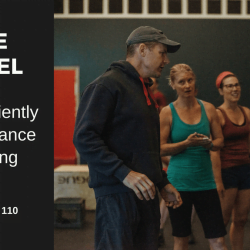 This doesn’t mean quitting climbing in favor of downhill mountain biking, it means simply that you want to keep learning new movements that keep you in that thoughtful/exciting/frustrating zone to help keep your motor learning potential high. Perhaps the simplest way to gain semi-permanent endurance is to improve the muscles’ efficiency over time. This means creating a situation of training the muscular endurance capacity for a prolonged training cycle, while backing off on all other aspects of training. The downside is that you will lose strength and power, the upside is that you can hang on forever while trying to figure out how to do the next set of moves without the finger strength to do them! Muscular efficiency compromises the ability to bring in and push out energy via the blood, includes the ability to convert oxygen and glycogen to usable fuel sources, and includes the ability to process waste quickly. All of these things are trained the same way – by creating an environment that stresses the system. Motivation is key to endurance performance. You have to have clear goals in mind when you take on a training program. Endurance comes steadily, piece-by-piece, and you need to grapple with the process of building it every single session. By its very definition, endurance is fatiguing. Strength training can leave you feeling fresh. Power training can be fun. Endurance training almost always strips off your armor and makes you suffer for it. With this in mind, you need to have your heart in the game if you’re going to improve. If you’re not feeling it – don’t start. Come back tomorrow or next week or next phase when your drive matches the needs of your training. I am a fan of developing endurance in such a way that you avoid getting pumped rather than the classic method of getting pumped silly. That being said, even with an aerobic-alactic training program, you’ll still have to peak your endurance, and that means pain. You need to be comfortable with the fact that it’s going to hurt and that dealing with the pain is a skill that you can control. How pumped can you be and still not cry? How much suffering are you willing to take to stay stuck to the stone? Training to tolerate pain is essential to your long-term success. The general ideas put forth above might seem a bit academic in nature and hard to apply. I agree, but the whole picture is important once we start trying to break down exactly what to do in the gym or at the crag to get better at holding on for full pitches and getting more pitches in. Yes, the details are key, but a purely “black box” approach – only knowing that x input equals y result – can leave you lost of your schedule or environment for training changes.